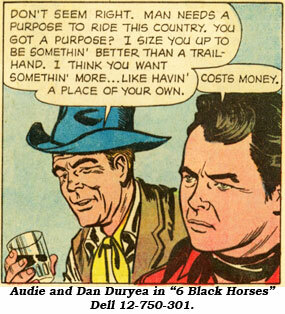 There was never a regular series Audie Murphy comic book. There should have been. At this late date we’ll never know why the editors at Dell never considered such an idea. However, Universal-International, in promoting Audie as their new western star, arranged for him to be cover-photo featured on Marvel’s WESTERN LIFE ROMANCES #2 (3/50) in a photo with Gale Storm from “Kid From Texas”. Hard to find comic, $48 in Fine when you do. 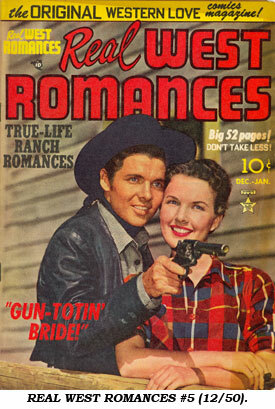 Audie and Gail are also on the cover of Simon and Kirby's REAL WEST ROMANCES #5 (12/50). Toby Press’ combination movie mag and comic, TRUE MOVIE AND TELEVISION #3 (11/50), carried a third page photo and bio of Audie. 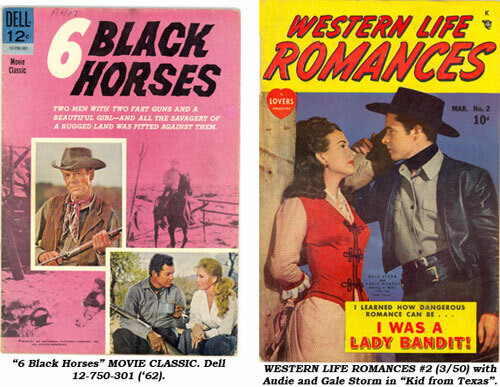 But the only true Audie Murphy western comics are Dell’s MOVIE CLASSIC (#12-750-301) adaptation of Universal’s “Six Black Horses” issued in January ‘63 with a photo cover of Audie, Joan O’Brien and Dan Duryea. Fine copies can be found reasonably priced at $9. Fawcett’s MOTION PICTURE COMICS issued a comic version of Audie’s “Red Badge of Courage” in July 1951 with art by Bob Powell. Fine copies are a bit expensive at $54.